Quantity and quality, generally speaking, are mutually exclusive. Mass popularity usually does not mean critically acclaimed—David Letterman never got the highest ratings, OutKast never sold the most records. The Venn diagram of things with mainstream popularity and considered best in class overlap but a sliver. It is my humble opinion that KFC’s coleslaw resides within that overlap. I cannot find figures verifying KFC serves America’s most-consumed coleslaw, but I venture to guess our nation’s 13th largest chain restaurant can stake a claim. As for its deliciousness? Subjectively, I believe I have a strong argument. One reason is the mediocrity of all others of its ilk: Every plastic cup of coleslaw served alongside a sandwich box lunch has been, in a word, unmemorable, to the point I now usually discard it by muscle memory. Many of these coleslaws taste incongruous, meaning the cabbage and dressing never achieve synergy. Cabbage is a tough ol’ veg, requiring much acid to break it down from its roughage state. I don’t believe most cooks give the cabbage as fine a shred as it necessitates, which is why to me most coleslaw might as well be rabbit food. 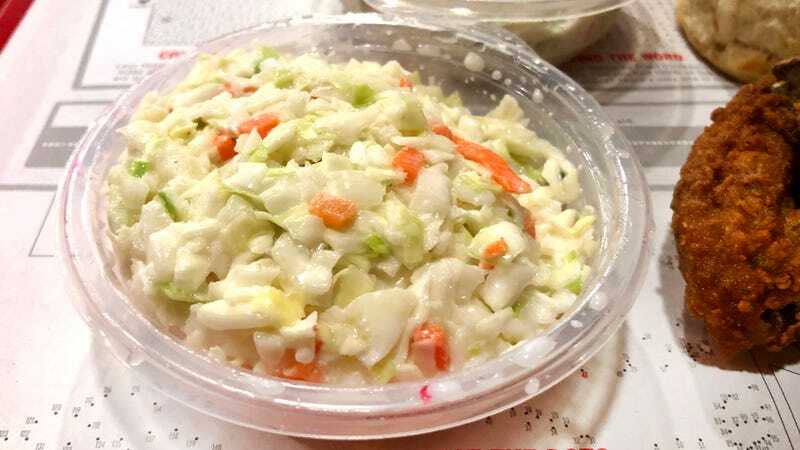 KFC gets coleslaw right by chopping its cabbage, carrots, and onions almost to a mince, but not so fine that all semblance of texture disappears. There’s still enough crunch, but its corners rounded with the creamy smooth dressing of mayonnaise and vinegar (distilled, corn, and apple cider). 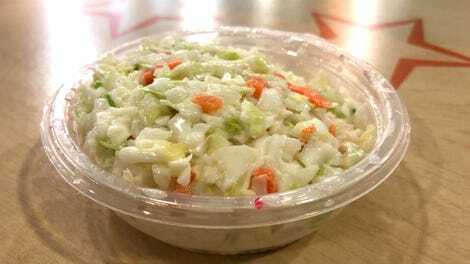 Even though it doesn’t list it among its ingredients (and none of the copycat recipes feature it), there’s the briefest suggestion of horseradish—a high-in-the-nose mustardiness—that I really enjoy in KFC coleslaw. Nostalgia plays a big part of it. It was the first coleslaw in my life, and perhaps all coleslaws are unfairly judged against it. But all these years later, and many inferior coleslaws with superfluous blackcurrants and kohlrabi-variations behind me, I still stand by the fact KFC remains the gold standard of coleslaw. It’s uncomplicated, it’s bare bones, it’s great on a warm biscuit, and the leftover dressing is most excellent to slather over your chicken. Cities with most fast-food restaurants per capita clustered in Midwest, oh yeah! Kevin Pang is editor-in-chief of The Takeout and director of the documentary For Grace on Netflix. If you had to pick a non-French fries accompaniment for burgers, what would it be?